Who did it first? We don't know. What we do know is that everyone wants a piece of the IPL, some a little more than the others. Virat Kohli's heart rate is racing like a tracer bullet? You can see it on your screen as this one goes right down to the wire? This may go all the way." That's how Shastri, who has a well-known predilection for certain phrases, may have described it on air. But it never happened because players refused to wear heart rate meters around the time Lalit Modi birthed the Indian Premier League (IPL) six years ago. "We wanted players to wear meters that would show their heart rate during high-pressure situations, like a tight last-over finish. We thought the heartbeat sound, along with the heart rates on big screens, would give spectators a unique experience. But some players expressed their reluctance and we respected that," says Modi in an email interview. He also wanted to let the camera follow players into the dressing room. But players' reluctance again came in the way. Still, Modi, who was the force behind the IPL's first three editions, managed to pack enough in the 20-overs-a-side league for it to become one of the biggest business innovations to come out of India. Business? Isn't it a game we are talking about? Well, Fast Company magazine in 2010 put the IPL at number 22 in its list of the world's biggest innovations for creating "a new economy of cricket". Writer Danielle Sacks wrote: "In baseball, they'd call that a home run." Sacks lives in Brooklyn, the New York area that has been a hotbed of baseball since the sport's early days in the 1850s. Had she seen the kind of frenzy the IPL has created, she might have been tempted to describe baseball's successes as fours and sixes. After all, the Indian league has already spawned replicas in soccer, tennis, badminton, and now kabaddi. And there are now T20 cricket tournaments in Australia, Bangladesh, Sri Lanka, and Nepal which one day hope to be just like the IPL. All right, confession time. Twenty-overs-a-side cricket did not start in India. The format, as the game itself, began in the United Kingdom. The Benson & Hedges Cup, England's domestic one day tournament, 50-overs-a-side, had to be killed in 2003 because its title sponsor was lost to the Tobacco Advertising and Promotion Act. The shorter version, Twenty20, stepped in to fill the void. It ended up doing a lot more. It ushered in barbecue zones, beer tents, music bands, karaoke, fancy dress, and games for children, and re-introduced the game to spectators who were turning away from it. Twenty20 grew beyond the traditional fan base of the game and embraced families looking for a fun evening out. Surprisingly, outside England, it was the stodgy Pakistan that first experimented with the format, followed by the ever-adventurous Australia. At this time, the Board of Control for Cricket in India (BCCI) was a sceptic. "What is Twenty20," Niranjan Shah, its secretary at the time, was quoted as scoffing in 2006. "Why not Ten10, or One1?" Everything changed as India won the first T20 World Cup in 2007 in South Africa. And it did to the shortest format what the previous World Cup win in 1983 had done to the one-day format of 50 overs a side. Quick to soak up the little global sporting glory that comes its way, the country of a billion cricket fans put its weight behind the new format. The first attempt to monetise the format came from Subhash Chandra, who was also the first to tap satellite television with his Zee bouquet of channels. He started the Indian Cricket League (ICL), with nine teams, each identified with a city. Big names like Kapil Dev and Tony Greig gave it their blessings. This was Chandra's bid to become India's Kerry Packer. The Australian tycoon, in the 1970s, paid pots of money to the biggest names in world cricket to start his own league and brought the Australian Cricket Board down to its knees. The board was compelled to give broadcast rights to Packer's Channel 9. Chandra, too, was smarting from a BCCI snub over broadcast rights. In less than two years, though, Chandra's ICL subverted the theory of first-mover advantage. The generally lackluster BCCI showed unprecedented swiftness in banning all players associated with Chandra's league and deprived it of facilities. The killer blow was delivered by the BCCI's new infant, the Indian Premier League. Helmed by Lalit Modi, the IPL rode on the untold riches the board had recently struck, the limitless stadia and other facilities, the honour of being the Indian national team, and having powerful people in its ranks. "Had it not been for the pioneering vision of the ICL, the BCCI would have gone ahead with the 50-over format. It would have been a disaster. So in an ironical way, I just hope the BCCI remains indebted to the ICL for showing it the right direction," says Himanshu Modi, who heads Zee group's finance and strategy teams, and headed the ICL. The other Modi, Lalit, does not react kindly to suggestions that the ICL showed him the way. "The ICL was an unrecognised and unauthorised league, which had no sanction either from the BCCI or the International Cricket Council. Thus my very basic objection to the ICL was concerned with its very existence, which was questionable at the least. It is important to compare two like entities; you cannot compare two disparate events and draw parallels," says Lalit Modi. And he says the ICL, even though it came before the IPL, had no real novelty. Way back in 1994, Modi became ESPN's partner and brought it to India. At the same time, he was thinking of a city-based cricket league, and the name he had in mind was - here it gets really curious - the Indian Cricket League. He had the players signed. The BCCI, when Madhavrao Scindia was its honorary Chairman, bought into the idea. Then Jagmohan Dalmiya became the board's chief and he was far less enamoured of Modi's ideas. Things changed as I. S. Bindra brought Modi into the Punjab Cricket Association, which paved his way to the post of the BCCI's vice-president. Given Modi's background - he is the son of tobacco tycoon K. K. Modi - the onus of growing the business of cricket fell on him. He made broadcasters cough up a lot more. Harish Thawani's Nimbus paid Rs 2,730 crore in 2006 for four years' rights. This came on the back of team sponsorship going to Sahara for Rs 314 crore and kit sponsorship to Nike for Rs 197 crore. The total was a 10-fold jump over the revenue figure of the previous four years. Thus pregnant with money, the BCCI gave birth to the IPL. But, with Modi as the midwife, it couldn't be just another cricket league. A careful auction of franchisees engendered strong city loyalties among fans. It was surreal to hear the Feroz Shah Kotla ground, home to Delhi Daredevils, erupt in loud cheers at the fall of Sachin Tendulkar's wicket when Mumbai Indians came to play. Such a thing had never happened to Tendulkar in India. Chandra's ICL was more inclusive, but spread itself a bit thin. One of its teams was Lahore Badshahs, which may have struggled to find a committed fan base in India. 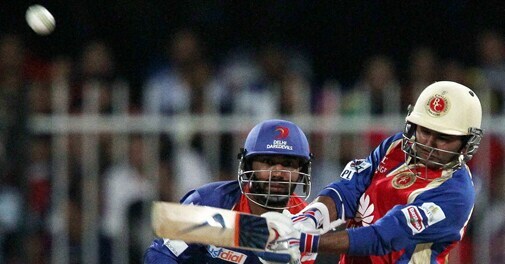 The IPL's players auction, potentially a drab affair interesting only to accountants, became a television event, creating match-like drama with rising dollar figures. And who adorned the buyer tables? Film stars and big businessmen. Every time actresses Preity Zinta and Shilpa Shetty raised their manicured hands, or Mukesh Ambani's wife Nita conferred with her advisors, or the camera focused on actor Shah Rukh Khan, you paused an extra second to watch. "A lot of people have asked me if the mix of franchisees was contrived. The answer, though, is that our mix of Bollywood celebrities and corporate India was derived by default, thanks to a very open and transparent bidding process. Frankly, I could not have written a better script even if I had tried," says Modi. Once the first match began on April 18, 2008 in Bangalore, the Indian cricket fan saw a new world. It had music (played by disc jockeys in the stadium), glamour (people who need to wear dark glasses after sundown), and colour (cheerleaders). "The fact that the IPL had an entertainment quotient comforted us as here it was not team India's performance that mattered. It was positioned as a family entertainment platform. That the property had a strong linkage with Bollywood meant we could target newer sets of audiences such as women and, of course, the youth," says Rohit Gupta, President, Multi Screen Media, the company that owns IPL broadcasters Max and Sony Six. "We managed to sell 50 per cent of our inventory even before the tournament started." Players sat in dugouts just outside the boundary rope, instead of being hidden away in the pavilion. There was live commentary by players and umpires from the field of play. And there were quick interviews with players right after the end of the innings, as sweat dribbled down their temples. The game came closer to the viewer. With matches coming on television in the evening hours, even your mother began to have an opinion on the game. It helped that the Indian league had the best of global talent on show. If ever evidence was needed that money made the world go round, here it was. It was also the first time an Indian cricket event was covered live (or deferred live) globally. What's more, now players could earn a good living from the game even if they did not get into the national team. The on-field activity kept pace with the off-field ones. Rajasthan Royals, the cheapest franchise, captained by ageing Australian Shane Warne, whose nickname Hollywood is well-earned, went on to win the tournament with a bunch of players who were nowhere near their captain in fame or notoriety. This was 2008. The final was played on June 1. The Lehman collapse was still three and a half months away. India was dreaming of economic superpower status. Its middle class' income was growing fast and aspirations even faster. 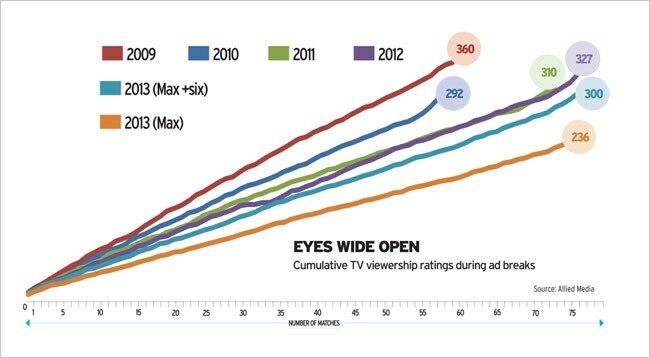 Naturally, advertisers jumped on to the new vehicle, which showed an unprecedented reach across age, gender, and income profiles. They also loved the little extras the IPL offered, such as the mid-innings timeout. "The IPL helps us connect with consumers. It gives us a captive audience like no one else does," says Ronita Mitra, Senior Vice-President, Brand Communication, for Vodafone. The company has been a big spender on the league since its first season and its ZooZoos are as much a part of the three month event as the cheerleaders. Even a couple of spots per match are said to yield high value. "The IPL is a great leveler as it reaches out to people across states, languages and communities. Any advertiser with a national agenda will want to be there," says media buying agency Mindshare's Principal Partner Kiran Konsam. As advertising, reassured by high television viewership, burgeoned, the IPL became the BCCI's cash cow. It may have been inspired by the English Premier League soccer tournament, or the National Basketball Association league in the United States, but it has its own economics. It does not, for instance, depend on stadium ticket sales. Its biggest sources of sustenance are broadcast rights, title sponsorship, money from companies who want to attach their name to every boundary scored, sale of franchisees, and merchandise. The BCCI keeps a part of this money and gives the rest away as prize money and franchisees' share. After just a year, the IPL grew big enough, and bold enough to go toe-to-toe with the big fella, the Indian government. The home ministry wanted its dates changed for the 2009 edition, the year of that other great Indian circus: Parliament elections. But Modi said no. The government said it would not be able to provide security for the matches. Most people would have backed down and complied. Modi shifted the IPL - lock, stock and players - to South Africa. The South African government and cricket board embraced the IPL like their own. So did the fans, who turned up in droves to cheer teams from Indian cities even though their own cricket season was over, the wickets were tired, and the threat of rain never far. The shift to South Africa was an act of defiance, audacity, and execution. It was the IPL's way of declaring its independence. It is sad to see this almighty empire shake at its roots. Modi has a good life. He lives in a mansion in one of London's richest pockets. His photographs appear next to expensive cars, one of which bears a personalised number plate, CRI3KET. But he cannot come to India. Not right now. And he has been cast out of his beloved IPL. There are accusations of tax evasion and money laundering, which he denies. With time, politician Sharad Pawar moved away from the BCCI and N. Srinivasan, the head of India Cements, took control over it. Modi was a favourite of the former, and there is no love lost between him and Srinivasan. 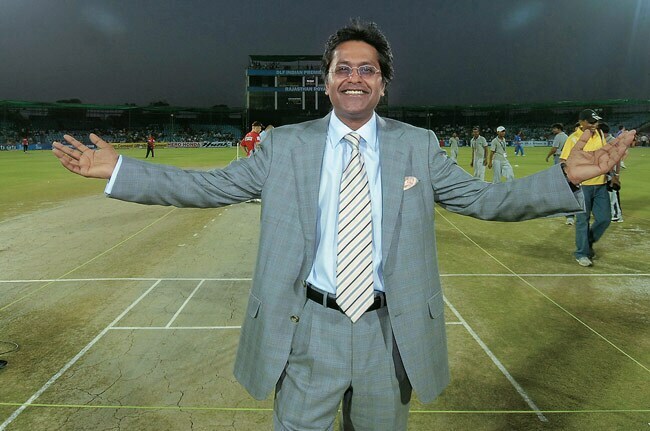 In 2010, he was ousted as the IPL's Chief Commissioner on charges of corruption. He was later banned by the board. Ironically, the IPL degenerated into more infamy once Modi was out. So much so the Supreme Court has had to step in. It forced Srinivasan, whose son-in-law is accused of betting and fixing matches, to step aside. Srinivasan would be one among very few people who see no conflict in his being the head of the BCCI and his company India Cements owning IPL team Chennai Super Kings. "The IPL needs to be carved out of the BCCI and listed on the stock exchange. That needs to be done with the franchises, too. When millions of people own the property, there will automatically be good governance," says Shailendra Singh, Joint Managing Director of advertising and media network Percept Holdings. But a high valuation on the stock market is no longer a guarantee. 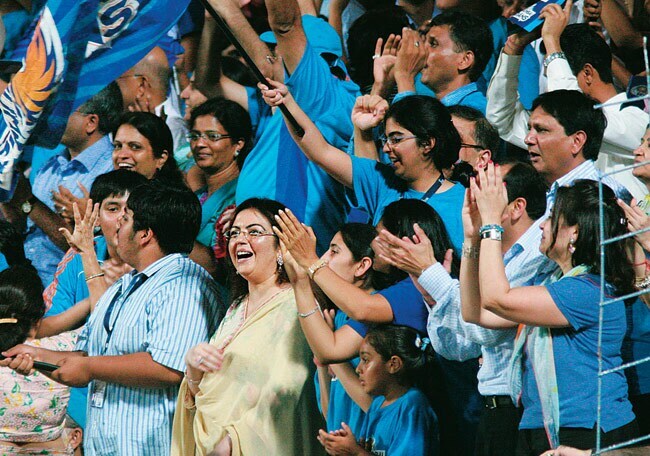 "The past few years have seen a steady erosion of the brand value of IPL. 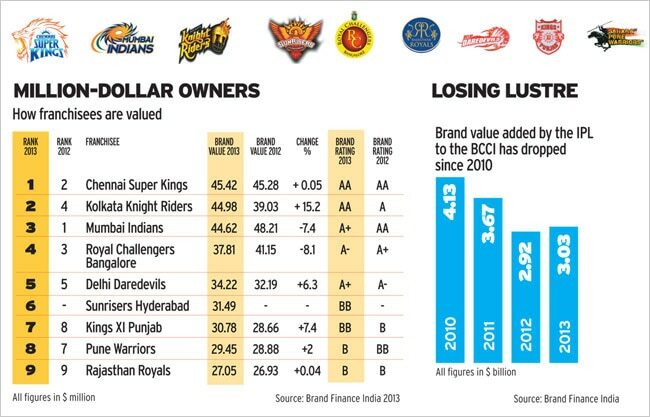 The validation by the Supreme Court of the corrupt practices inside the boardroom of the IPL has created a fracture in its brand value," says Unni Krishnan, Managing Director, Brand Finance India, which pegged the IPL brand at $3.03 billion last year, down from $4 billion in 2008/09. If that is harsh, wait till you hear what the Supreme Court said. 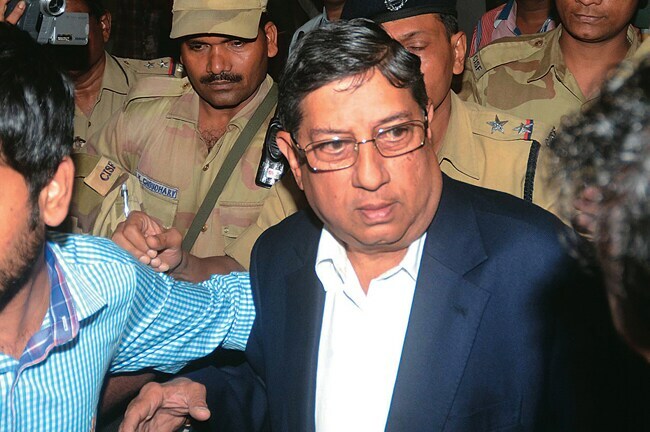 "His (Srinivasan's) staying on is nauseating for cricket," Justice A. K. Patnaik said on March 25. That would be music to Modis ears -- he sees everything wrong with the way Srinivasan runs Indian cricket. What adds to the melody is that after the return of Vasundhara Raje as Rajasthan's Chief Minister, Modi is again sniffing around the top post at the state's cricket association, which he once headed. According to newspaper reports, the Supreme Court has allowed the Rajasthan board to announce its election results, which the BCCI has been opposing. The disclosure is expected on May 6, the day this magazine hits the market. But it is already believed that Modi, who managed to contest from abroad, has won. Modi therefore may hope to find a way back into India. If he had his way, the RCA's results would be greeted by cheerleaders, loud music, and perhaps a gig by Shah Rukh Khan. And there may be a title sponsor in attendance.